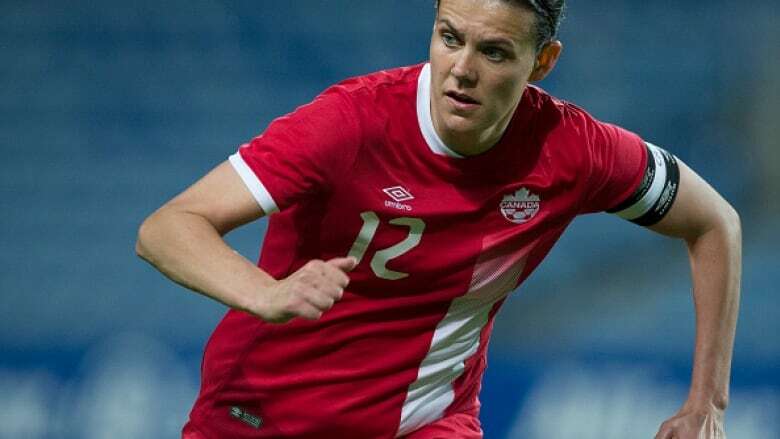 Christine Sinclair plans to step forward and speak out. Sinclair, who turned 34 Monday, is going to take an active role in the fight against multiple sclerosis. Christine Sinclair has always done her talking on the soccer field. She has carried the Maple Leaf at the Olympics, represented her country 259 times, scored 168 goals and led Canada to back-to-back Olympic medals. And the classy Canadian captain has done it quietly, without a fuss. She is not one to seek the public eye. But now Sinclair plans to step forward and speak out. Sinclair, who turned 34 Monday, is going to take an active role in the fight against multiple sclerosis. Sinclair made the decision after speaking last year at a fundraiser for the B.C. chapter of the MS Society of Canada. "For me it was the first time sort of stepping out of my comfort zone in terms of MS and the impact it's had on my family," she said in an interview. "Having done that, I realized that it was something I wanted to be a part of and I felt like I could help make a difference." Sinclair's mother Sandi has MS. She lives in a care home in suburban Vancouver. "She's the strongest person I know," said Sinclair, her lip quivering as the emotion rises. "This past year she's lost her husband, her mom, her dad and her brother and she just keeps going." Christine's father Bill died in April 2016, less than four months before the Rio Olympics. He was 69. The Canadian women's soccer team, which holds its captain in the highest regard, banded around Sinclair in the days leading up to the Games. Sinclair has seen first-hand "the slow progression" of MS. Her mother is bound to a bed and a wheelchair. Sandi was in a car accident when Christine was a sophomore in college. "That was the last time she ever walked and she's been in a wheelchair ever since," she said. The Sinclairs are a soccer family, with Sandi introducing her daughter to the sport very early. "On the way home from the hospital after she was born, she went to a soccer practice before we even went home," Sandi told the Oregonian in 2014. "I was coaching a women's team and we had to stop by the soccer practice on the way home from the hospital. "That's what our family is like." The Sinclairs remain a tight family. Christine, who plays club soccer for the Portland Thorns, regularly jumps into the car with her dog and makes the 5 1/2-hour drive to Vancouver. "She has two grandkids that she spoils to death and loves to death. She's upbeat," her daughter said. That includes organizing trips out for regular lunches with friends. MS is an autoimmune disease of the central nervous system (brain, spinal cord). The disease attacks myelin — the protective covering of the nerves, causing inflammation and often damaging the myelin, which is necessary for the transmission of nerve impulses through nerve fibres. The effects are wide-ranging and unpredictable: extreme fatigue, lack of co-ordination, weakness, tingling, impaired sensation, vision problems, bladder problems, cognitive impairment and mood changes. The cause remains a mystery — the belief is lifestyle, environmental, genetic and biological factors all contribute. Currently there is no cure. According to the MS Society, Canada has the highest rate of multiple sclerosis in the world, with an estimated one in 340 Canadians living with the disease. "Obviously anything I can do to help, to help find (the cause), help find a cure, I'm all-in," she added. The MS Society says women are three times more likely to develop MS than men. It's the most common neurological disease affecting young adults in Canada (most often diagnosed in young adults aged 15 to 40). "I don't even fully understand it and it's been a part of my entire life," Sinclair said. "I want to become part of this to educate the public but then find a cure. I don't want other people to go through what my mom has gone through, what our family's gone through and the difficulties you face every day. "The hardest part is seeing someone physically deteriorate in front of you, yet mentally is just as sharp as ever. Being in a care home where she's 20 years younger than anyone else in there and she's social . .."
Sinclair pauses to take a breath to compose herself. "Yeah, it's tough," she said finally. Like her mother, Sinclair looks for the positive. "I think great can come out of it," she said. "When I told her I was joining this fight, I don't think she's ever been more proud of me." Details of her involvement will be released later this year.